Hi I am Sam. I have been suffering through a binging disorder for over 5 years now. I made a lot of progress over the years; I could go without binging for over a week, or sometimes when I would binge I could catch myself in the middle and be able to stop. But since the last two weeks I have been binging every single day, feeling uncontrollably helpless! My weight is just piling on and on. What do I do? They say journal writing helps, but it hasn’t been working for me. I feel so awful right now. Please tell me what to do? The more I think I’m a binge-eater, the more I binge. Also, last month I confessed to my mom about this issue. We live in Pakistan and eating disorders is something hardly anyone is aware of. So when I’m like I have this disorder and I’ve researched a lot on it, she’s like don’t be ridiculous..it happens to those who weigh like 400 pounds. And she’s like don’t read about it anymore on the internet and also that ‘you can control it yourself too if you try! I mean does she think I haven’t TRIED? This is purely ridiculously irritating! She did agree to take me to a psychologist, but only God knows when! She is very lazy and cool at things; which by the way pisses me off a lot. I need help! I’m stuck in this cage with no one to open it! What do I do? Hi Sam, I’m sorry that you’re not getting the support that you need from your Mom nor your community. If she is not supporting you in getting the appropriate help, you might have to take it on yourself to get support. I would definitely recommend joining an online support group to help you discuss what’s going on for you with others who are dealing with the same thing. Try to have an honest discussion with your mother. Tell her that you have something serious going on and that it’s very painful for you when she dismisses your feelings. Explain to her that you have a very serious problem and you need her help, not her denial. As for your eating, journaling is a great start. You say it’s not working for you, but I would encourage you to keep at it. 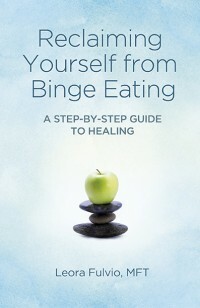 Healing from binge eating is a process and it takes practice. When you are feeling like you are ready to binge eat, grab your journal and just write, draw a picture, anything. Tell yourself that you can go eat after 20 minutes of writing. After 20 minutes, you might find that the urge has diminished. You might try mechanical eating to start with. That is, making sure that you are eating 3-5 meals per day by the clock. For instance, you know that every morning you eat your breakfast at 7:30am, a snack at 10:00, lunch at 12:30, a snack at 4pm, then dinner at 8pm. This will ensure that you don’t get too hungry and binge out of hunger and desperation. Do lots of diaphragmatic breathing. For instance, each hour, on the hour, take 60 seconds to breath into your belly. In less than a minute you should be feeling relaxed, when you feel that you are about to go toward a binge food, stop for 60 seconds and breathe. This mindfulness integration will give you a bit more time to make the choice as to whether or not you want to binge rather than the binge choosing you. Try adding a little extra protein at each meal. This can help your digestion slow down and help keep your blood sugar stable and your belly fuller longer to keep your urges/cravings a little bit more controlled. By discussing what you are going through with other people, you won’t feel alone, and you will learn different recovery techniques. You can also use the forums as a place to turn when you’re wanting to binge, it can be your support and your distraction as well. Goodtherapy shared this photo on facebook today. Wow. It’s so true isn’t it? 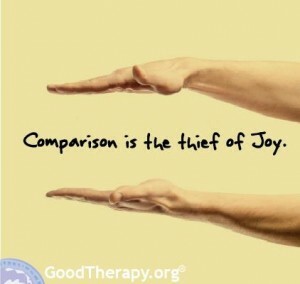 That feeling that you get about yourself when you start to compare yourself to someone else… it’s just painful. There’s so much that we’re not — but what we are– when we focus on that– it can be pretty amazing. Exercise for the minute: Quick 5 things that you are that are great. Some adjectives for help– compassionate, kind, helpful, smart, interested, cuddly, stylish, well read, funny, thoughtful, considerate, silly, snarky, sarcastic, witty, good listener, punctual, organized, artistic, creative, active, laid back, colorful, energetic— anything there fit? What about you? I’ll be you can name 5 things about you that are uniquely you and wonderful.